Set within the famous Korean restaurant Chunjiin, known especially for their kimchi dish. Ko Ho-Tae (Song Il-Kook), who grew up as an orphan, begins to work at the restaurant. Ho-Tae was abandoned in front of an orphanage when he was only 4 years old. He then left the orphanage at the age of 18 and soon became involved with the mafia. More recently, the #1 crime boss in his group was hospitalized. The #2 man in their crime group begins a loan sharking business. Ho-Tae doesn't like the #2 guy or the loan sharking business. One day, Ho-Tae goes to a western food restaurant where a woman named Kang-San (Park Jin-Hee) works. Ho-Tae arrives to meet a man who is in debt to the crime group for a past loan. Ho-Tae warns the man that he has only 2 days left to pay back the loan plus interest. While eating his lunch, he also complains about the salad. Kang-San overhears Ho-Tae's complaint about the salad and asks exactly what is wrong with the salad. Then, Ho-Tae's subordinate's phone rings and they leave with the man in debt to them. Kang-San becomes worried about the guy in debt and goes out to stop them from taking him. Before they leave, Ho-Tae tells her that that the salad is overpriced and too sweet. More vinegar would make the salad much better. On the roof a building, the #2 crime boss demands the indebted man to give up his $500,000 dollar apartment as compensation for his $50,000 dollar debt. Ho-Tae finally reaches his boiling point and snaps. He beats up the other gang members including the #2 crime boss. Afterwards Ho-Tae eats lunch at a restaurant which he isn't happy with. He sees on TV at the restaurant a story about Chunjin Restaurant. Ho-Tae feels something from the story. He decides to go to Chunjin Restaurant. He stands in front of Chunjin Restaurant and remembers years back when he stood there as a young child. Ho-Tae then receives a phone call from his subordinate. Meanwhile, Kang-San decides to add vinegar to the salad dressing and, to her surprise, notices that the salad tastes much better. At that time, she receives a phone call from her sister Woo-Joo (Lee Min-Young) who informs her that she has to come home on her dad's birthday. Ho-Tae arrives at a junk yard to meet his subordinate, but finds himself surrounded by other gang members from his group. Ho-Tae is beaten and, during this time, a car with a siren blaring arrives in front of Ho-Tae. The driver from the car gets out. To Ho-Tae's surprise, the driver is Kang-San (the woman from the western restaurant). Kang-San takes Ho-Tae away and tries to take him to a hospital, but he refuses. The next morning, Ho-Tae wakes up in a strange room. Ho-Tae remembers being the room when he very young. Ho-Tae goes out of the room and meets all of the family members from Chunjin Restaurant. Kang-San's father Ki-Chan (Kang Shin-Il) asks Ho-Tae to stay at Chunjiin Restaurant a couple of more days. A man then arrives offering to buy Chunjin Restaurant but Ki-Chan kicks him out. Kang-San and her sister Woo-Joo have arguments over Chunjin Restaurant and personal matters. Kang-San wants to sell Chunjin Restaurant, but her sister Woo-Joo wants her to quit her job at the western restaurant and take over Chunjin. The next day, Ho-Tae still can't remember exactly why Chunjin Restaurant is so familiar to him and decides to ask Ki-Chan. But, Ki-Chan is gone and left behind a note saying it's up to you whether to sell Chunjin Restaurant and I have to go take care of something. All of the people at Chunjin Restaurant are dumbfounded. Ho-Tae leaves without an answer. He goes to meet his subordinate who asks Ho-Tae to hide until the #1 crime boss recovers. Without Ho-Tae, the #1 crime boss can't get control back. Filming began late September, 2011. "Kimchi Family" is followed by "How Long I've Kissed" on February 29, 2012. Eastender Jul 05 2018 5:52 pm I loved Kimchi Family. It was so heartwarming and lovely. The cast was wonderful, and the scenery was beautiful. The kimchi looked spectacular. I recommend this drama! Ragi Nov 28 2017 1:11 am Reading all the comments below made me think to watch this too. I have watched Jumong and Jang Yeong-sil before and of course The Return Of Superman with his lovable triplets. Jhosie Oct 18 2017 6:45 pm This is a rare gem. A highly recommended must watch. The writing is superb! The meaning of family is showcased through the intertwined stories. Song Il Gook nails his character once again. All the actors excecuted their roles perfectly. The setting is wonderful. The beauty of nature and Korean cooking in full view for everyone to enjoy. 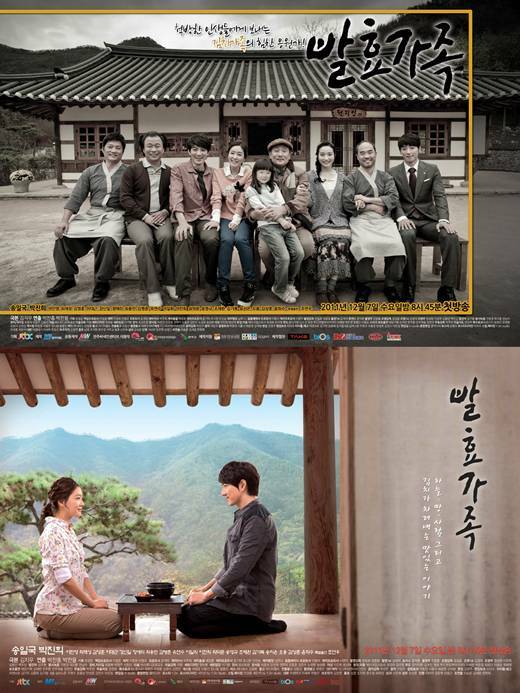 A heartwarming drama you will want to watch over and over again. lrt Sep 29 2017 10:41 pm Full of parables and super delicious food you can't take your eyes off of!! Lorraine Paul Oct 01 2016 12:44 am In this drama SIG is outstanding. However, he is also surrounded by a wonderful ensemble of fellow actors. The 'father' of the two girls is always exceptional in any drama he appears in. In this he has a smaller part (so far), but an essential one. The 'Uncle' is sublime. He has the ability to express so much by just looking at the camera or a fellow actor in the scene. There isn't one thing out of the place here. I just love Kdrama, even though I am Australian of European descent, it speaks to my heart even through subtitles. Skonmzy007 Nov 06 2015 4:54 pm SIG....as alwayz is a great and extraordinary actor!!! any drama he is casted in is a must watch, he is jst very impressive.....really love u right 4rm Jumong nd, wil alwayz continue 2 support u my love 4 ever. u did a great job here in this drama "fermentation family" i love this drama, very cool beautifully shot, nd breathtaking.......wit much romance and excellent story. looking forward to more of ur dramas and movies......4rm ur no.1 fan. Shortfus Aug 21 2015 3:53 pm What a pleasant pleasant surprise! I didn't expect anything from this drama, just something to pass the time while something good comes along but I REALLY REALLY enjoyed the drama. It's like finding a gem when I wasn't looking for one. I loved the quiet and peaceful back ground of the drama and the location was simply gorgeous! I would MOST definitely eat at the restaurant if it was real. I loved the making of kimchee they had during each episodes. I didn't even know some of the kimchee they made existed! The story was simple and yet touching and warm. It was great to see Choi Jae-Sung again! He was such a heart-throb in the 90's and he still looks good! Sometimes a drama without a villain, as long as written well, like this one, is a must! Very very well done! random1 Sep 25 2014 2:31 pm love this drama, i kept salivating at all the meals lol. i checked the cast list and i can't seem to find the actress for the female reporter from ki ho tae and hyun soon's orphanage. does anyone know who she is? Aj Aug 16 2014 6:33 am This is one of the sweetest love stories in KDrama. It is also a warm story about family with a dash of mystery, heartache, humor, reconciliation and so much more. I have loved SIG since Jumong and have seen most of his work: this is my favorite of all his performances. He develops such a strong, touching character; plus he and PJH light up the screen in a mature, funny, beautiful romance. Tony Reynolds Dec 21 2013 5:35 pm I have recently discover Drama Fever via Roku in the USA. My wife and I are really into Korean dramas. We really like Fementation Family - called Kimchi Family with English subtitles through Drama Fever. I am still feeling my way to learn more of the details. Does anyone know where in Korea this was filmed? Where is the house/restaurant located? I did find the official website but I do not read Korean. Virtue Oct 06 2013 2:55 am One of my favorite kdramas. Worth watching. I am always excited what kimchi to prepare every episode. Like the actors and actresses, too. Also, one can learn so many lessons in life here. I urge everyone to watch this. Gift Alex Sep 04 2013 6:40 am intelligent, active, wonderful in acting and very lovely oppa, ride on. love your acting. herbmom Sep 03 2013 3:04 pm Beautifully photographed film. Strong story lines. Good acting. Loved the life lessons that came from the foods prepared. Warm, entertaining drama. Only wish was for a bit more romance, although the one kiss was pretty good. Jewels May 04 2012 5:55 pm This was a beautifully done series. I've been away from Korea for 40 years and this is the first time that I was actually homesick for the land, the culture and the people. Story of what makes a family and cultivating relationships, old or new, were heart warming. The scenery shots in the series were simply breathtaking to me. Just Loved it! dodz Apr 27 2012 11:56 pm Haven't posted in an online forum for a long while but I feel the urge to do this now after having just completed watching this drama series. It's been a long while since a book I've read or a movie or drama I've watched has spoken to me so clearly, so movingly and so personally as this drama has, It's not just about kimchi-making. It's also about how the making of kimchi is so closely tied to the life you've led and are leading & to the people you've met and are with in your life. More so, the story of making kimchi is wonderfully wrapped up with the core idea of the importance of the ability to accept yourself (flaws and all) and your place in life among the people that matters to you. All the characters (major and minor) have unitedly performed so well to bring about a sense of wholesomeness to this drama series. There is no other word than the word 'superb' to describe Song il Gook's portrayal of Ki Ho Tae or Ko Han Dol in this drama. There is such a great scent of invigorating freshness to the idea of humanity after watching this drama. I do thank everyone involved in the production of this series for such a beautiful piece of work. NewKDramaAddict Mar 13 2012 6:29 pm Excellent drama! Watched it twice! Gasenadi Mar 03 2012 5:05 am Who plays Chairman Oh's 2% Mistress? A familiar face with more exposure than the "movie star and family". Gasenadi Mar 02 2012 6:31 pm Who plays Ho Tae as a child? I could understand leaving some of the cameos from the credits. But these are two characters (the Chairman's Sec. and Ho Tae, child) that repeatedly appear and are crucial to the understanding of the storyline. Saludos desde Puerto Rico. Gasenadi Mar 02 2012 2:59 pm Who plays the Chairman's Secretary, Woo Tae Bok? He's not listed in the credits which is strange, it's an important role. Otherwise, a very entertaining drama. Another one where we're invited to empathize with the orphaned gangster trying to rehabilitate himself. The music is also unique to this drama. Just love it. Saludos desde Puerto Rico. Leah Feb 12 2012 11:16 pm Fermantation Family is Perfect!!!! Jung Ae Ri great acting too. Congrats to the whole cast! songj-je Dec 27 2011 12:21 pm I'm sure that you will be good as always My Dear Song Il-gook.Wish you Luck! rory Nov 09 2011 1:50 pm I look forward to watching the movie! Obviously SIG will be the best as usual!